SnowPure has been providing EDI technology to the power plant market since 2002. 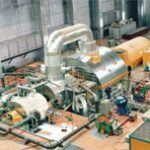 Power plants around the globe are utilizing our Electropure EDI™ including locations in the United States, Central America, Europe, the Middle East, and China. With the introduction of our higher-capacity EXL™ product we are now able to serve a greater share of the power plant market including larger installations. Combined-cycle power plants and all high-pressure steam turbines require high-pressure water, free of silica. SnowPure’s EDI and GTM products replace traditional chemical-based resin systems, making an all-membrane process. Click here for more information on our high-capacity EXL™ modules.